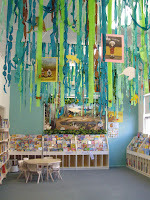 Go on a Book safari and discover Cronulla library's newly transformed jungle - a Book Week jungle. That's right its book week again & this years theme is" Book Safari". Cronulla is putting the challenge out to its borrowers to discover the hidden book week characters hiding in our jungle poster, can you find them all? Cronulla Library will also hold numerous school visits, celebrating the high quality of children's books produced every year here in Australia, including role plays, games and quacking like a chicken. Don't let the schools have all the fun! Go on safari and discover all the wild and wonderful creatures that can be found at Cronulla Library - but watch out for those Chickens! Book Week officially runs from August 22nd - 28th. The shortlist is out, and the winners will be announced on Friday 21st August. All libraries in the Sutherland Library participate and have decorated accordingly. Go on a Library safari and visit them all, or view their displays online.